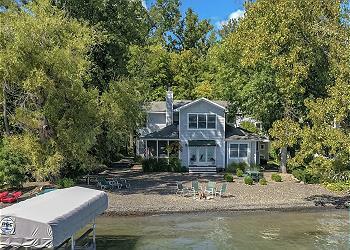 Family owned, this generational home will leave you craving your next visit to Canandaigua Lake before you even leave! Located minutes from Bristol Harbor, downtown Canandaigua and the quaint Village of Naples - Menteth Landing is centrally located on the west side of the lake and boasting with luxuries. Inside, a stunning blend of modern amenities and vintage décor greet you. From across the great room, the cool blue of Canandaigua Lake shines through the wall to wall windows. A custom built bookshelf hugs the wall belonging to a gas fireplace. Turn the fireplace on and cuddle up with your family on those chilly nights. A beautifully tailored kitchen with top of the line appliances are yours to enjoy. Chef up your favorite meals and treat your friends and family to a "family style" dinner served on the formal dining table. Completing the lower level, a bedroom with queen size bed and lake views is available. From across the hall, the first floor bath with stand up shower is accessible. Upstairs, three of the six bedrooms can be found. The master suite, boasts a king bed and lake views and a full size bath with additional hallway entrance. The sister bedroom to this grand space is a cozy room with a twin size bed. Down the hall, the third bedroom on the second floor can be found - offering lake views and a queen bed. The newly remodeled guest house is available for your group to enjoy while they stay at this spectacular home. Inside, the full bathroom with stand up shower can be found just off the entry. Upstairs, the living area of the guest house offers the same vintage meets contemporary feel. Crisp colors and décor beam throughout. A pull out sleeper sofa is available in the living area. Just off this cozy space, you'll find a small kitchen with white cabinetry. Completing the guest house are the final two bedrooms beaming with comfortable beds and luxury lake vibes. Outside, a natural lake frontage is yours to enjoy. Run, play, sunbathe and enjoy the best view of Canandaigua Lake from Menteth Landing! Take the row boat or kayaks out for a paddle and see what adventures await you during your Finger Lakes vacation. Menteth Landing is centrally located on Canandaigua Lake. Travel 10 minutes south and find Joseph's Market where you'll enjoy local produce, locally famous Monica's Pies, and Hazlit Winery. Or, venture north and spend the day beer tasting at Kershaw Park, attend a wedding at the New York Kitchen, or enjoy boutique shopping in downtown Canandaigua. There's so much to do when you choose Menteth Landing as your Finger Lakes destination!